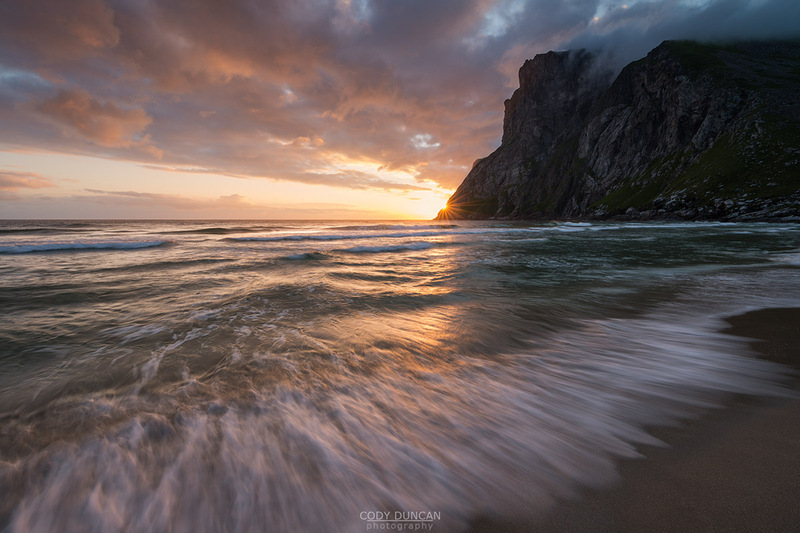 Summer is when the Lofoten Islands are most alive. 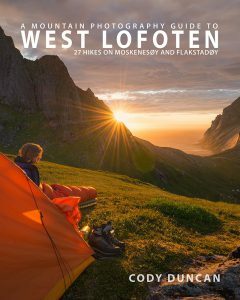 I invite you to join me and experience the magic of the midnight sun while exploring some of Lofoten’s most iconic mountain views. We will hike through flower filled meadows on our way to views of white sand beaches and azure waters – so inviting that the bravest of you might even attempt a swim! The workshop will officially begin in Leknes at 12:00 on Saturday, July 1 and end in Leknes at 12:00 on Friday, July 7. Please schedule your arrival as close as possible to these times. Pickup/drop-off will be available at Leknes airport or city center. 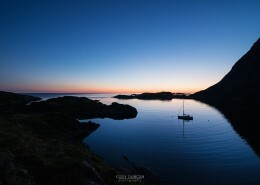 Accommodation: We will be based on Vestvågøy, in the heart of Lofoten. This allows for the greatest flexibility when choosing destinations for the day. We will often not return until the early hours of the morning after our hikes. Physical Ability: Moderate to good physical ability is required for this tour. Though none of the planned hikes are overly physically demanding, we will aim to reach several mountain peaks of up to 600 meters and spend some 4-8 hours away from the car at any given time. Payment will be made in Norwegian NOK, for the amount of 21 000 NOK. Euro price is an estimate and subject to change with currency fluctuations. The deposit is required to reserve your place on the workshop. Deposit is non refundable. Full payment is due 60 days before workshop. 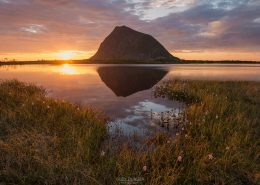 The goal of this workshop is to experience the magic of the midnight sun while visiting some of Lofoten’s spectacular mountain views. 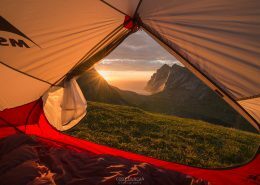 Along the way, instruction will be given on how to compose and photograph a variety of mountain scenes, as well as learning about efficient packing and choosing the right gear for the right destination. Weather cooperating, we visit 2-4 mountains ranging from 400-600 meters in height. While none of the routes are difficult, a moderate level of physical fitness is required with at least some previous hiking experience. On a typical hiking day, we will begin our journey around 21:00 and return to the car around 03:00. If the light is still good, we may visit an easier roadside destination before finally returning to our accommodation for some sleep. We might do some sight seeing during the day, but this is not the focus of this tour as we need to save our energy for our midnight adventures. As it will never be dark, we don’t plan on any camping. 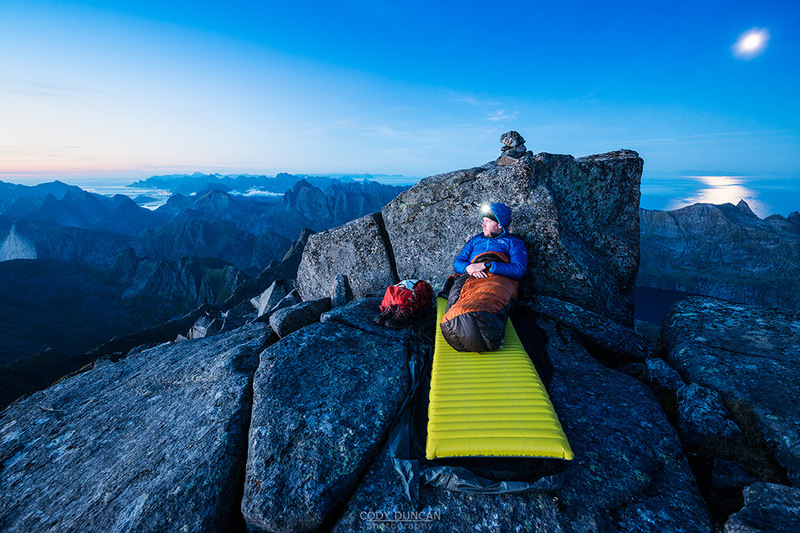 However, weather permitting, some open air mountain naps might be possible from time to time. 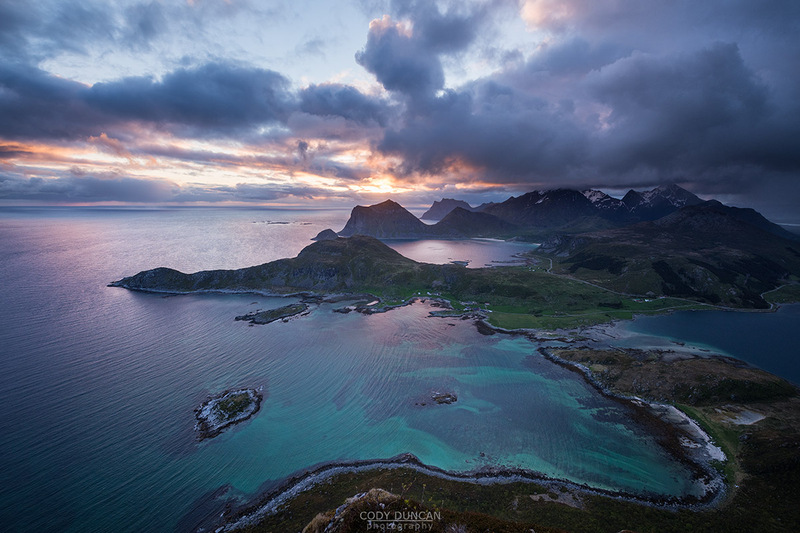 The nature of Lofoten requires a great deal of flexibility to the local weather conditions once on the Islands, so we will typically pick our planned destination only a few hours ahead of time. 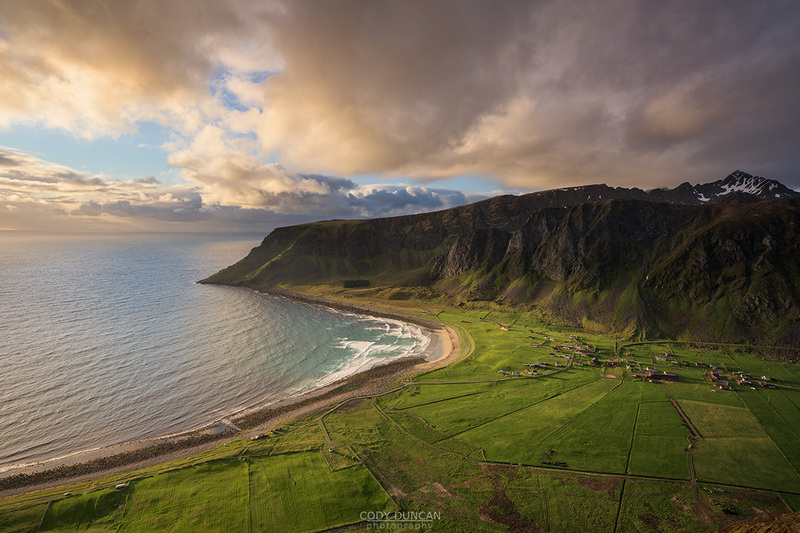 If the weather is too stormy and moody for the mountains, we will focus on coastal areas and hidden beaches of the Islands, taking shelter among the cliffs. As this workshop takes place in the height of summer, the northern lights will unfortunately not be visible. You will be picked up in early afternoon in Leknes. We will first head to our accommodation to drop off baggage and pack our bags for hiking. As there is no night, we might begin our first hike this day if the weather is promising. We will switch our body clocks to become nocturnal. The majority of our outside time will be from mid evening until the early morning hours. We will typically attempt to sleep from mid morning to early afternoon. Mountain hikes are planned for 3 days on this trip, allowing us some flexibility to wait for ideal conditions. Our goal is to spend the hours around midnight away from the road and up in the mountains. Depending on the conditions each day, we will decide to head either east or west in search of the best light and conditions. 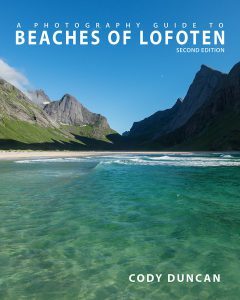 On rest/weather days, we will explore some of Lofoten iconic and easier to reach beaches and views. The tour will officially end at 12:00 in Leknes. However, all attempts will be made to best accommodate transport to your departing flights or ferry. 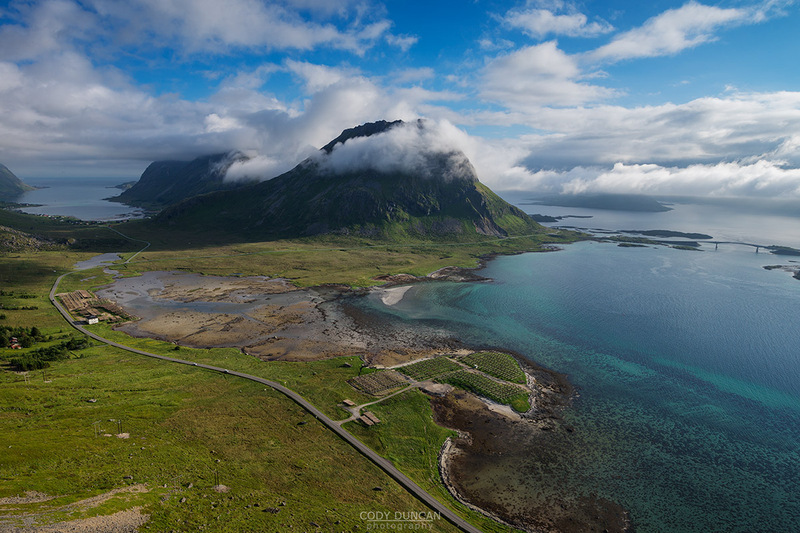 All transportation on Lofoten, including Leknes airport pickup and drop off in passenger van. 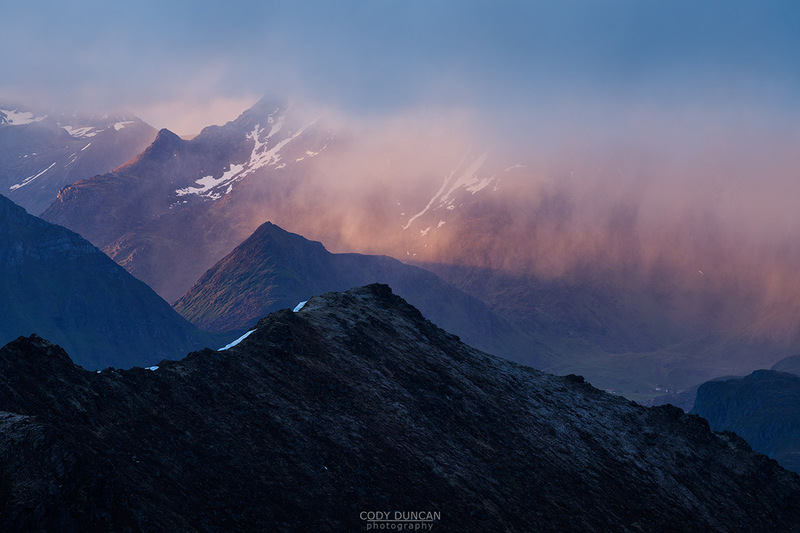 Complimentary downloads of Cody Duncan’s eBooks prior to the trip. Meals: Each individual will be responsible for their own food. We will have nearby options of restaurants and supermarkets. You will need a camera bag which is suitable for mountain hiking. This means it should not be overly heavy, while having enough room to carry your camera gear, extra clothing and some food/water. Camera – Any camera welcome, but a full frame DSLR or mirrorless camera with manual mode will give you the best performance. 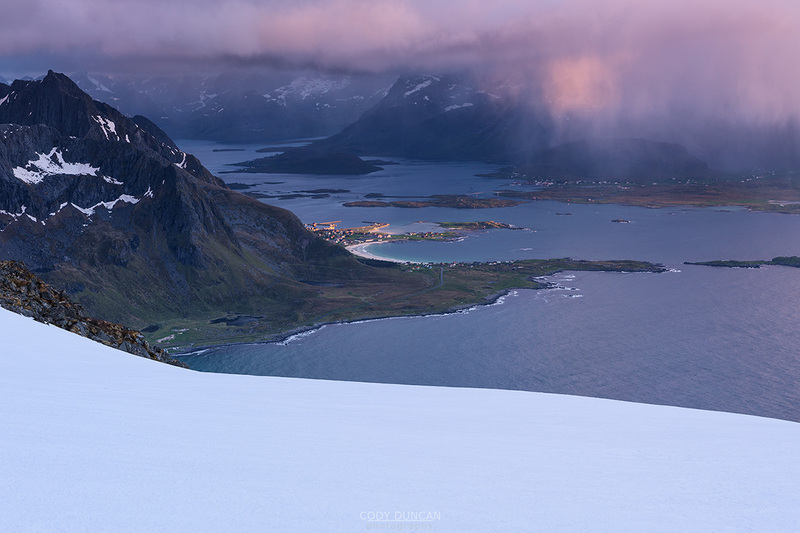 Tripod – A light tripod that you are able to take hiking is preferred. Lenses – A selection of lenses from 14 to 200mm is recommended. Batteries – Bring enough batteries to last for several days of shooting. 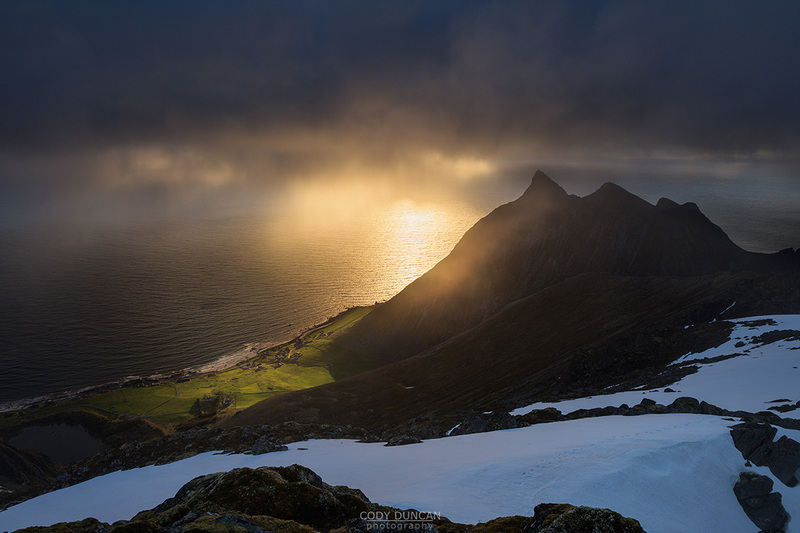 The focus of this workshop is to explore Lofoten’s scenic and wild mountains and valleys. While I will do my best to avoid as much bad weather as possible, we will likely end up with rain at some point. This means you will need to be fully waterproof (upper and lower) as well as having enough insulation to handle potentially cool, damp conditions and wind. Proper hiking footwear prepared for muddy trails is also a requirement for this trip, as we will be spending much of our time away from the road. In addition to good shoes, you will want to have extra socks on hand in case your feet do get wet. I would suggest having 2 pairs per day. 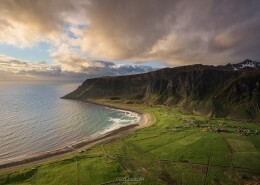 In 2010 he created the website 68 North to showcase his ever growing Lofoten portfolio which has now become one of the best photography and travel resources available today. 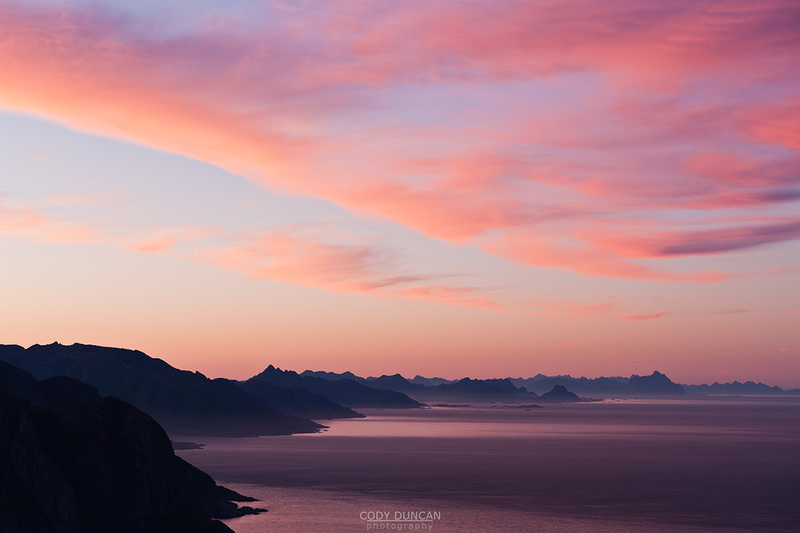 In 2015 Cody began publishing photography guides focused on the unique seasonal nature of the Islands, drawing upon his years of experience exploring hidden corners and lonely mountain tops across Lofoten. Cody was born and raised in Santa Barbara, California. Spending many of his early years surfing the cold waters of the Pacific, just down the road from his childhood home. His early 20’s saw him turn his focus to the mountains, soloing numerous 4000+ meter peaks in California’s Sierra Nevada mountains. 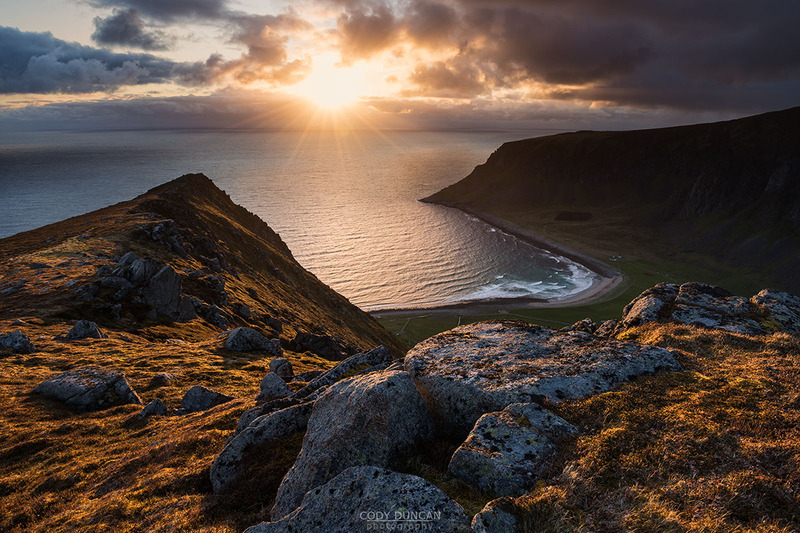 As his photography career developed, he soon found himself spending more time in the wild landscapes and turbulent weather of northern Europe. 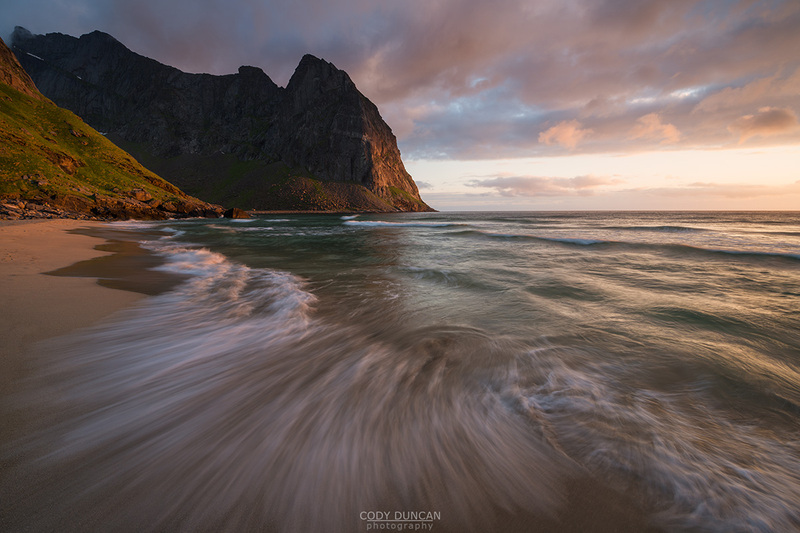 Cody’s images have been published by: Visit Norway, National Geographic, Men’s Journal, Sunset Magazine, Lonely Planet Magazine, GEO Saison, British Airways High Life, and numerous calendars, travel guides, and more. Tour price due at time of payment is 21,000 NOK. Euro price of €2,250 based on estimate of € 1 = 9.25 NOK, this is subject to change and may affect final price at time of payment. Any cancelations will be fully refunded (minus deposit) up to 90 days before tour. After that, no refunds are available.